Villa qualified for the final courtesy of a 2-1 semi-final win over Liverpool on Sunday and Sherwood is now looking ahead to the Gunners clash where his players can again perform freely without pressure. However, Sherwood indicated that Premier League fixtures now take preference over the decider which takes place on May 30. “We will be the underdog. The pressure will be on Arsenal,” said Sherwood on the club’s official website. “They are the holders. They want to win it again. “We have a lot of hard work now. We put this on the back-burner. “We need to secure our safety and then come back here and take the game to Arsenal. 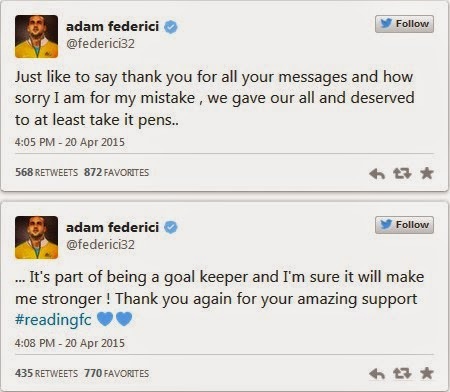 Meanwhile, Reading goalkeeper Adam Federici has apologised for his howler in their FA Cup semifinal defeat to Arsenal. The Australian inexplicably let a tame Alexis Sanchez shot slip through his grasp in the sixth minute of extra-time and could only watch on as it trickled over the line. Arsenal midfielder Santi Cazorla offered words of support to Reading rival Adam Federici after reaching the FA Cup final. Arsenal are into the final after Federici handed them a 2-1 extra-time victory. “Yes of course, it’s unlucky for him. They played well and defended very strongly. In the second half, we lost control,” said Cazorla. Arsenal boss Arsene Wenger was delighted with goalscorer Alexis Sanchez for their FA Cup semifinal win over Reading. Reading took Arsenal to extra-time before losing 2-1. The Frenchman said: “He has made a fantastic contribution this season. He looked to struggle a little bit to get into the game but he has that stubborn resilience and that individual potential that allows him to always create something special.